VATICAN CITY (CNS) — Pope Francis’ calendar of liturgical services for January and February — including the first two weeks of Lent — includes a Mass marking an important feast day of the Marian icon, “Salus Populi Romani” (health of the Roman people) in Rome’s Basilica of St. Mary Major. Pope Francis, who is particularly devoted to the icon, will celebrate Mass at the basilica on Jan. 28 — the feast of the icon’s formal installation in a side chapel of the basilica by Pope Paul V in 1613. The Byzantine-style icon, which is 5 feet high and more than 3 feet wide, is painted on thick cedar planks. It depicts Mary embracing Jesus as a young boy. Jesuit missionaries once distributed reproductions of the image to promote Marian devotion around the world and several popes have used the ancient icon to invoke the saint’s protection for Rome. 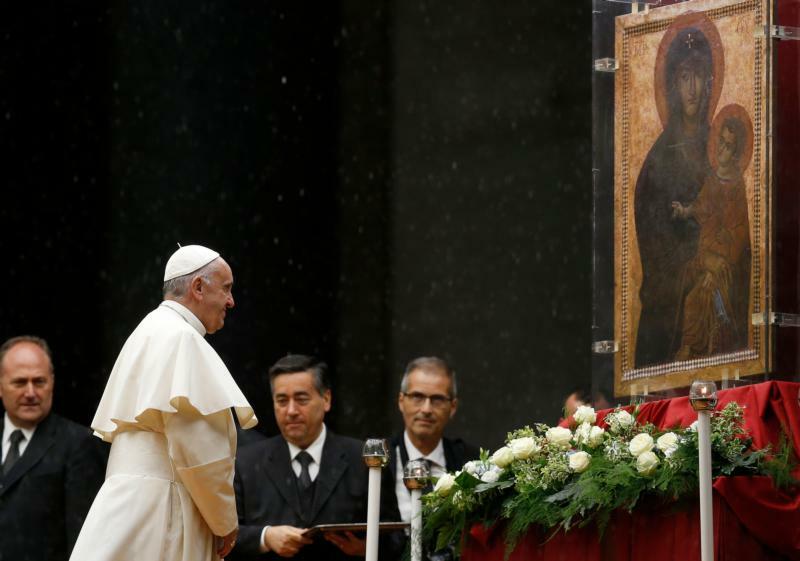 The icon has had a place in the hearts of Rome citizens since the 16th century when their prayers to be saved from the plague seemed to be answered after the image was carried through the city streets in a procession. Pope Gregory XVI crowned the image 180 years ago on the feast of the Assumption in 1838, after he prayed for an end of a cholera epidemic the year before. On his first morning as pope, Pope Francis knelt and prayed before the icon so “that she may watch over all of Rome,” he said on his election night. Since then, he has made it a tradition to visit the icon before and after each of his foreign trips. — Jan. 25: An evening prayer service in the Basilica of St. Paul Outside the Walls on the feast of the conversion of St. Paul, closing the Week of Prayer for Christian Unity. — Feb. 2: Mass in St. Peter’s Basilica celebrating the feast of the Presentation of the Lord, which the church marks as the World Day for Consecrated Life. — Feb. 14: Ash Wednesday procession from Rome’s Basilica of St. Anselm to the Basilica of Santa Sabina for Mass and the imposition of ashes. — Feb. 18-23: Lenten retreat with officials from the Roman Curia in Ariccia, outside Rome.